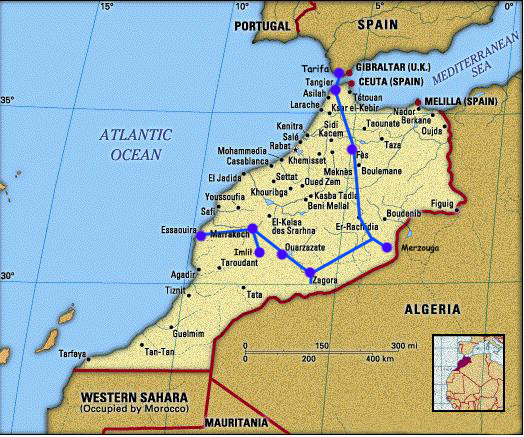 Tangier is the Tijuana of Morocco. A mere half hour ferry ride from Spain separates Africa from Europe here. While it certainly has the trappings of a border town, there is a true working-class medina at the heart and a large new town surrounding it. We spent only a day and a half here before heading to Fes, but enjoyed a great tour of a communal bakery. Fes will always be my first thought when someone says "Morocco". It has a gigantic medina that is bustling with life, tourist and local. Once inside the gates and away from the hassling wanna-be guides, you can really get into the streets and see behind the curtain. Fes may be Morocco, but Merzouga is our gateway to the Sahara. A 10 hour bus ride east of Fes through the Atlas mountains, Merzouga sits not 20 miles from the Algerian border surrounded on all sides by dune or desert. Here is where we jumped onto camels for the journey to the mother of all dunes - 650 meters of sandcastle rising above us, begging to be climbed before sunrise. From Merzouga, we headed south by car with our new friends Mac and Scott. The first day's drive was through rolling desolation that seemed in spots to be copies of California or Utah deserts. The second day we spent time at a Koranic library and village south of Zagora before having lunch in a quiet palmerie (communal garden with corn, date palms, etc) and on to Oaourzazate to see the restored kasbah of Ait ben Haddou. We didn't give Marrakech a fair shake. After loving Fes, we immediately saw Marrakech as a big city. French, metropolitan and growing. The medina is large and active. The sites are interesting and surrounded by a new city that offers everything you need. But it just seemed like the Disney version of Morocco. Admittedly an uniformed and unwarranted criticism of what I'm sure is a beautiful town, but we had the memories of medina Morroco that we wanted. From Marrakech, we did take a a trip up to the mountain village of Imlil to hike up Jebbel Toukbal, the highest mountain in North Africa at something just over 14,000 feet. After the hike, everyone was a little "Morocco-d out" and needed a break. Mac and Scott were heading off to Paris and we bee-lined for the beach. Essaouira is everything you'd want from a beach town: beach, seagulls, ancient fortress and medina, active fishing industry, and not much that really needs to get done.